For the film, see We Are the Night (film). 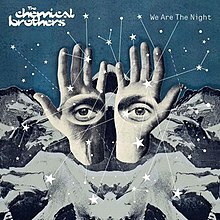 We Are the Night is the sixth studio album by English electronic music duo The Chemical Brothers, released on 27 June 2007 by Freestyle Dust, Virgin and Astralwerks. The record entered the UK Albums Chart at number 1 and debuted at number 65 on the Billboard 200. It was certified gold by the British Phonographic Industry. The album won a Grammy Award for Best Electronic/Dance Album at the 50th Grammy Awards. In June 2006, it was announced on their official website that The Chemical Brothers were working on material for a new album, then-codenamed "Chemical 6". Ed Simons of the duo was also quoted as saying that they would hope to "put a battle weapon out for the summer", a reference to their Electronic Battle Weapon series on white label. "Electronic Battle Weapon 8" and "Electronic Battle Weapon 9" debuted on Pete Tong's BBC Radio 1 show on 8 December 2006. The two tracks were later released as a double A-sided vinyl record prior to The Chemical Brothers' New Year's Eve appearance at Turnmills in London. A version of "Electronic Battle Weapon 8" is featured on the We Are the Night album under the title "Saturate". At the same Turnmills appearance, the duo debuted a track at midnight to welcome the new year. This track was eventually released as "Burst Generator", found on the album. The Chemical Brothers officially announced We Are the Night at their MySpace page on 21 March 2007. It suffered a delay in release due to an issue during production of the artwork. An online "old-skool" The Chemical Brothers computer game by EMI was subsequently released as an apology. On 12 April 2007, Tong was again privileged to debut a track by The Chemical Brothers. The first single from the album, "Do It Again", aired on his Radio 1 "In New Music We Trust" show. The album cover art was inspired by the work Things to Come by Bauhaus member Herbert Bayer. Used throughout the album is the classic technique of sampling The Chemical Brothers used on other albums. For example, the song "We Are the Night" uses a direct sample from "The Sunshine Underground" from Surrender. The album also includes samples of outside sources. The title track "We Are the Night" incorporates samples from "Decimazione Amanti" by Riz Ortolani and a reading of Ode to D.A. Levy by bill bissett. "A Modern Midnight's Conversation" uses a sample from Barbara & Ernie's recording of "Listen to Your Heart". The opening track, "No Path to Follow", is an intro track used for the title track which follows the song on the album. As with all other albums by The Chemical Brothers, some of the tracks segue into the next. These are 5 into 6, 8 into 9, 9 into 10, and finally 10 into 11. "Saturate" was released on 1 June 2006 as "Electronic Battle Weapon 8" exclusively for DJs to use in clubs. "Do It Again" was released on 14 May 2007. It reached number 12 in the UK charts. "The Salmon Dance" was released on 10 September 2007 and reached number 27 in the UK charts. "Battle Scars" was released as a download in remix form in later 2007. Subtitled "Beyond the Wizard's Sleeve Re-Animation". It is also a double A-side with the "Heavily Smoked by The Glimmers" remix of "The Salmon Dance". The album so far has a score of 67 out of 100 from Metacritic based on "generally favorable reviews". URB gave the album four stars out of five and said, "If we're to accuse Chemical Brothers of anything, it's trying to set a lofty new bar in the style they themselves created, and that no one else seems to be working anymore." BBC Collective also gave the album four stars out of five and said, "Rather than play catch-up, the Chems are accentuating the difference, digging deeper into melody instead of piling on the noise." Billboard gave it a favorable review and said that when the album "opens with a cataclysm of "Transformers" noises, it signals a record that's a little more unapologetically electronic than their previous ones." Spin gave it a score of seven out of ten and stated that "Tom Rowlands and Ed Simons continue to smear psychedelic synth cheese and stereophonic airplane noises over chewy grooves that veer closer and closer to straight disco." Other reviews are pretty average, mixed or negative: NME gave it a score of six out of ten and stated that the song "All Rights Reversed" saved the album "from sounding like it's still stuck in the mid-'90s and with Willy Mason and Midlake cropping up, Tom and Ed have again found just enough cool mates to save them from a general feeling of naffness." Yahoo! Music UK gave the album six stars out of ten and said it "feels bloated and ornate amongst the elegant functionalism of post-millennial club music." Drowned in Sound also gave it a score of six out of ten and said, "While there are moments that have the summer days – and daze – of ’99 flooding back, too much of this sixth long-player proper sounds disjointed and manhandled." musicOMH gave it three stars out of five and stated: "While you may know what you're getting with a Chemical Brothers album, they remain damn good at what they do.... You get the impression that their next album may have to be a bit more adventurous if they're to survive." Now also gave it three stars out of five and said that it was "quickly evident... that the Chemical Brothers are making a serious go at being contemporary.... They pull it off relatively well for the most part." Prefix Magazine gave it an average review and said that "Tom Rowlands and Ed Simons pull out all their tricks, delivering an album of euphoric psychedelic electronica, quirky guest appearances, and danceable grooves." Slant Magazine gave it a score of two-and-a-half stars out of five and said that the album, "like most high school reunions, fails to kick-start anything other than nostalgia." Sputnikmusic gave it a score of 2.5 out of five and stated that "the end result is a record that runs quite average, [and] there are some quality songs that can be picked from it... but by itself it will lose many listeners." Stylus Magazine, however, gave it a D and said that the album "isn’t awful, but you can hear the rigidity of its formula, like the motorik title tune that burps up its eponymy every few seconds along a signless, moody highway." ^ a b John Bush. "We Are the Night". Allmusic. Retrieved 31 October 2011. ^ Simons, Ed. "dj dates". Archived from the original on 3 November 2007. Retrieved 12 July 2007. ^ B. Van Isacker (18 May 2007). "New album The Chemical Brothers delayed - here's a 'sorry guys'". side-line.com. Retrieved 31 October 2011. ^ "Official website MoMA". Retrieved 1 April 2015. ^ "an ode to d.a.levy by bill bissett". thing.net. Retrieved 31 October 2011. ^ Alternative Press (pp.173-174) - 4 stars out of 5 -- "Ed Simons and Tim Rowlands have lost none of their enthusiasm for block-rocking beats....The duo remain committed to pushing electronica in ambitious new directions." ^ Michaelangelo Matos (17 July 2007). "The Chemical Brothers - We Are the Night". The A.V. Club. Retrieved 31 October 2011. ^ Michael Hamersly (20 July 2007). "Snap Judgments (The Chemical Brothers: "We Are the Night")". Chicago Tribune. Retrieved 15 June 2013. ^ Adrienne Day (20 July 2007). "We Are the Night Review". Entertainment Weekly. Retrieved 27 May 2012. ^ John Burgess (29 June 2007). "The Chemical Brothers, We Are the Night". The Guardian. Retrieved 31 October 2011. ^ Nate Patrin (2 July 2007). "The Chemical Brothers: We Are the Night". Pitchfork. Retrieved 31 October 2011. ^ Tim O'Neil (16 July 2007). "The Chemical Brothers: We Are the Night". PopMatters. Retrieved 31 October 2011. ^ Sam Richards. "The Chemical Brothers - We Are the Night". Uncut. Archived from the original on 18 May 2008. Retrieved 31 October 2011. ^ Steve Yates (28 June 2007). "The Chemical Brothers: We Are the Night". BBC Collective. Retrieved 15 June 2013. ^ Jeff Vrabel. "We Are the Night". Billboard. Archived from the original on 20 September 2007. Retrieved 15 June 2013. ^ Mikael Wood (4 July 2007). "Chemical Brothers, 'We Are the Night' (Astralwerks)". Spin. Retrieved 15 June 2013. ^ Alex Miller (3 July 2007). "Album Reviews - The Chemical Brothers (We Are The Night)". NME. Retrieved 15 June 2013. ^ James Poletti (2 July 2007). "The Chemical Brothers - 'We Are The Night'". Yahoo! Music UK. Archived from the original on 14 July 2007. Retrieved 15 June 2013. ^ Mike Diver (3 July 2007). "The Chemical Brothers - We Are The Night". Drowned in Sound. Retrieved 15 June 2013. ^ John Murphy (2 July 2007). "The Chemical Brothers - We Are The Night". musicOMH. Retrieved 15 June 2013. ^ Benjamin Boles (28 June – 5 July 2007). "Chemical Brothers (We Are the Night)". Now. Retrieved 15 June 2013. ^ Norman Mayers (14 August 2007). "Album Review: The Chemical Brothers - We Are the Night". Prefix Magazine. Retrieved 15 June 2013. ^ Eric Henderson (16 July 2007). "The Chemical Brothers: We Are The Night". Slant Magazine. Retrieved 15 June 2013. ^ Zachary Powell (25 July 2007). "The Chemical Brothers - We Are The Night (album review)". Sputnikmusic. Retrieved 15 June 2013. ^ Dan Weiss (6 August 2007). "The Chemical Brothers - We Are the Night - Review". Stylus Magazine. Retrieved 15 June 2013. ^ "OLiS – Oficjalna lista sprzedaży". 23 July 2007. ^ "Irish album certifications – The Chemical Brothers – We Are The Night". Irish Recorded Music Association. ^ "Russian album certifications – The chemical brothers – We are the night" (in Russian). National Federation of Phonogram Producers (NFPF). Retrieved 28 March 2018. ^ "British album certifications – The Chemical Brothers – We Are The Night". British Phonographic Industry. Select albums in the Format field. Select Gold in the Certification field. Type We Are The Night in the "Search BPI Awards" field and then press Enter.